Do you find yourself brushing and flossing but still getting cavities? It can be frustrating but many people are prone to cavities despite taking good care of their teeth. There are a number of studies that show that your genetic make up can have an effect your caries (cavity) risk. It should be noted that these studies “suggest” this link but can not definitively prove it. What the studies tell us is that there is an inherited variation of the enamel (strong outer layer) development which in turn can effect the density or strength of the enamel layer. The chewing surfaces of our teeth have grooves or “fissures” on them which provides a space for food and bacteria build up in. The more grooves your teeth have, the more prone you are to cavities. Some people naturally have more grooves and thus more prone to cavities. As a child, these grooves are usually “sealed” but the practice of sealing teeth is not common as an adult; mostly because (1) its not covered by your insurance (2) there is an expectation that you are going to brush more as an adult. Crowding of teeth is another factor that increases your risk to getting cavities. Naturally there are “embrasures” or V-Shaped spaces between teeth that act as “spill ways” allowing food to not get trapped. 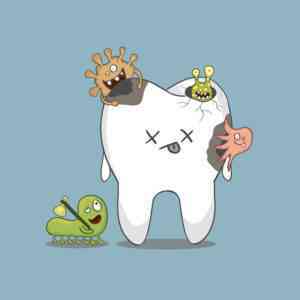 This is a self cleansing mechanism and so when teeth that are too close together, they trap more food and bacteria due to the loss of embrasure spaces. Also remember that crowded teeth make it harder for you to brush and floss. There are options like orthodontics to align your teeth properly and decrease the crowding. Invisalign is always a good option. Also keep in mind that crowded teeth and the accumulation of the plaque and calculus around them will cause periodontal issues. You may not know this but Saliva neutralizes acids and helps protect your teeth against cavities. With decreased Saliva (dry mouth), the acidity levels increase and leave you prone to cavities. A few common medications that cause dry mouth include medications to treat depression, anxiety, pain, allergies, and colds (antihistamines and decongestants), obesity, acne, epilepsy, hypertension (diuretics), diarrhea, nausea, psychotic disorders, urinary incontinence, asthma to name a few. Having regular dental checkups and cleanings are very important in identifying and addressing dental problems early. At each appointment in our Silver Spring MD dental office, we will go over oral hygiene instructions in detail and equip you with the tools and knowledge to avoid dental problems or emergencies. In office Fluoride Treatments are also recommended. Keep in mind that Fluoride helps strengthen the outer layer of your teeth. If you would like to discuss this topic further, make an Appointment with Dr. Nima Raoufinia in Silver Spring Maryland. Call us today at 301-565-4555 to make an appointment in our Silver Spring Maryland office with Dr. Nima Raoufinia to discuss the different options that are available to you.